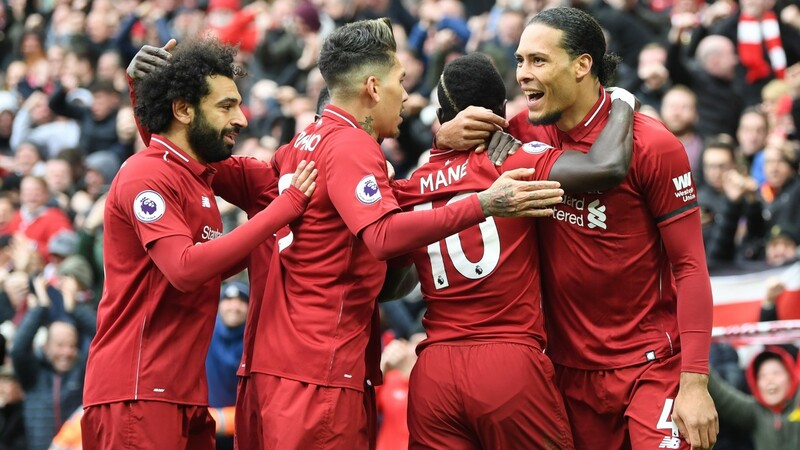 Jurgen Klopp's side, 6-4 at the start of the day, are 11-10 to claim the title following second-half goals from Sadio Mane and Mohamed Salah, who punished his former club with a sensational long-distance strike. Liverpool are two points clear of City having played one game more, but they have the easier run-in. The Merseysiders have games at Cardiff and at home to Huddersfield before a trip to Newcastle and facing Wolves at Anfield. Wolves have made a habit of making life tricky for the elite sides this season, although Liverpool will fancy their chances of finishing with maximum points, which would leave City needing to win their five remaining matches. Pep Guardiola's men - 4-5 for the title - were 3-1 winners at Crystal Palace. Raheem Sterling scored twice with Gabriel Jesus also on target - but tougher tests await the champions, including their game in hand at Manchester United on April 24. Before that City host third-placed Tottenham twice, first in the Champions League quarter-final second leg on Wednesday and then in the Premier League on Saturday. City's last three fixtures are Burnley away, Leicester at home and Brighton away, so the United and Spurs dates will probably decide the destination of this intense battle, which is 1-3 with Hills to be settled on the final day. Chelsea's Anfield defeat saw them pushed out to 7-5 for a top-four finish. Spurs are 1-4, while Arsenal can be backed at 10-11 with United 9-4 shots.